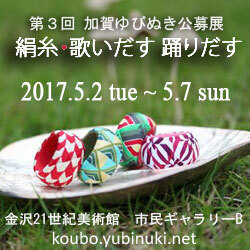 Unusual even in Japan, we are a shop specialised in Kaga Temari and Kaga thimbles. Our products been made by hand the traditional way, by stitching beautiful multi-coloured threads, and each item is truly one of a kind. In the past Kaga Temari (thread balls) were children’s toys. Now they are handicrafts used in interior design to decorate rooms. The delicate sound produced when shaken is characteristic of Kaga Temari. It is said that if the sound comes through clearly, the person holding the ball will become lucky. Kaga Temari is believed to have been first brought to Kanazawa during Edo Period (1603-1868) by Princess Tama from Tokugawa family when she married feudal lord Maeda. In Kanazawa there is a practice of giving these balls to daughters when they are marrying to bring them happiness. Since the shop’s establishment, we are making these cotton balls at Mariya by hand the traditional way, creating patterns with threaded needles, one thread at a time. Enjoy the beautiful, lucky Kaga Temari! “Kaga Yubinuki” silk thimbles are a sewing tool made since the olden days, and Kanazawa is the centre of this craft. They are made using thread, cloth or silk floss left after sewing kimono; creating thimbles out of them is a way of taking care of leftover materials. On the surface they are covered with a characteristic pattern made out of tightly woven, beautiful silk threads, while on the inside they are layered with silk floss and cardboard, which makes them very durable. At one time even people making Kaga thimbles were about to stop this tradition, which has been decreasing in popularity. However, in recent years both their beauty and the joy of creating the thimbles have been revived and new lovely patterns are continuously being brought out. While protecting the traditional craft at Mariya, we are also suggesting new gorgeous designs and ways of using Kaga thimbles. Sewing: This is the original purpose of Kaga thimbles. Wear it on your middle finger and push the needle through it when sewing instead of putting the needle down - this way you won’t lose it! As an accessory: The thimbles look just as lovely when worn as a pendant or a ring holding your scarf in place.